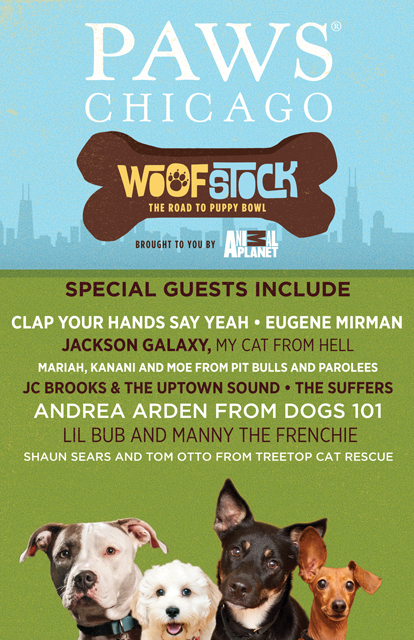 No city loves their pets more than the Windy City, so on Saturday, June 27, Animal Planet is hosting Woofstock: Road to Puppy Bowl, a free festival celebrating pet adoption with dozens of dogs, kittens and puppies available for adoption from PAWS Chicago! The family-and-dog-friendly event will be headlined by an attempt to break the Guinness World Record for the “largest gathering of adopted pets” while the main stage, hosted by Eugene Mirman of Bob’s Burgers, will feature stars from Animal Planet’s hit shows including Jackson Galaxy from My Cat From Hell, Mariah, Kanani and Moe from Pit Bulls and Parolees, Shaun Sears and Tom Otto from Treetop Cat Rescue, and live music from Clap Your Hands Say Yeah, The Suffers and Chicago’s very own JC Brooks & The Uptown Sound! The day also offers additional surprises and animal attractions, including pet advice from Andrea Arden of Dogs 101, Extreme Pet Tricks, a Puppy Bowl reenactment, and special appearances by internet sensations Lil Bub and Manny the Frenchie. Beyond the stage, Woofstock will feature “The Beer Sanctuary,” by Lagunitas, an array of food trucks, doggie obstacle courses, pet swag bags, and a photo opportunity with your dog at the replica Puppy Bowl field! Throughout the event, homeless pets will take center stage as PAWS Chicago hosts on-site adoptions featuring more than 50 dogs, kittens and puppies waiting to find their rock star families. Woofstock is presented with special support from AT&T U-verse, PAWS Chicago, ASPCA, Lagunitas Brewing Company and DogVacay. 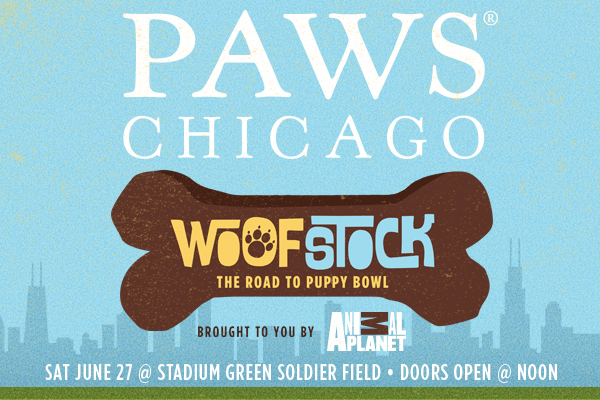 On June 27 and 28, the Woofstock adoption celebration will continue at PAWS Chicago’s Lincoln Park Adoption Center and North Shore Adoption Center, where Animal Planet will cover adoption fees for special “Rock Star” dogs and cats.